Oftentimes, real estate will be offered for sale by using the auction process. 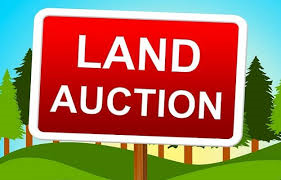 An auction is the process by which the public has an opportunity to offer (“bid”) money for property and the property is then sold to the highest bidder. However, the auction process can be confusing to understand or a bit intimidating. This post is by no means an exhaustive explanation or definitive guide to real estate auctions. Instead, I hope to provide some basic information and point out some potential sticking points that could cause issues in the auction process. In this area of the state, auctions are most often used to sell agricultural real estate, estate property, distressed property, investment real estate or the liquidation of assets belonging to a business or individual for one reason or another. The basic premise for an auction is the same: An auctioneer will begin by stating the rules for the auction. He or she will also indicate the terms that a successful bidder will be agreeing to in a contract to be signed following the end of the auction. Typically, the auctioneer will indicate whether the auction is an “absolute” auction or whether there is a “reserve.” However, the auctioneer will rarely indicate what the reserve amount is. If no statement is made about whether the auction is with or without reserve, consider there to be a reserve. Lastly, most auctions are tape recorded or video recorded in order to verify what was said and who bid the highest amount. Following the statement of rules and terms, the auctioneer will call for bids. This is the portion of the auction that you are probably familiar with from television or the internet. The auctioneer is not in fact offering the real estate for a set amount but instead inviting people to offer a bid. The auctioneer is usually stating something along the lines of “I have been offered $1.00, who will offer me $2.00?” The rest of the words are typically just filler words that do not mean anything. Some auctioneers will chant the call quicker and others slower. Additionally, the filler words will change between various auctioneers. However, the most important part of the calling of the bids is understanding how much the current bid is. If you get confused, just ask the auctioneer, he will tell you. At the close of the bids, the auctioneer will usually count down “going once, going twice, sold” or some other statement that the bid will close soon. Following the close of bids, a written contract will be signed by the seller and buyer with the actual closing happening sometime in the future. Make sure you have money to support your bid or have your financing approved prior to the auction. Auctions are not contingent on financing. By signing the contract, you are promising to pay the amount bid. Auctions typically require you to make all inspections prior to the date of the auction. The real estate is almost always sold “As-Is.” This means that you are buying the property in its present condition. Auctions can be intimidating for the untrained buyer or seller. Therefore, if you are concerned, employ a real estate agent or attorney that understands the process to assist you. Also, attend an auction and plan on not bidding. They are generally open to the public and can be interesting to observe. Lastly, here at Tallgrass Title, we routinely assist sellers and buyers on both sides of auctions. We are here to answer questions or direct you to somebody that can assist you. It’s our job!